This easy appetizer is perfect for your next get together, using bread crumbs and Louisiana crawfish tails, the crawfish cakes blends together lots of flavor and the perfect amount of spice. Form into desired size and lightly flour each side then pan sear in clarified butter. 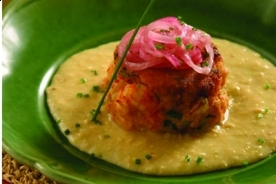 Recipe and Photo Courtesy of Louisiana Seafood and Red Fish Grill New Orleans. Used with permission.